Dinner Lake (g. by Sebring). 3 wins. See below. PHOENIX PARK (Royal Academy). 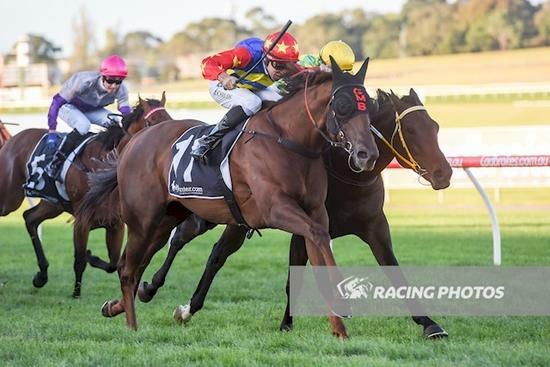 5 wins-2 at 2-at 1100m, 1200m, A$699,570, AJC TJ Smith S., Gr.2, STC Concorde S., Gr.3, Courtyard by Marriott H., Softex 2YO H., Harvey Norman 2YO H., 2d STC Theo Marks H., Gr.2, AJC Liverpool City Cup, Gr.3, Newcastle JC Spring S., Gr.3, 3d BTC Wyndham Estate Cup, Gr.2, STC Todman Slipper Trial S., Gr.2, Newcastle JC Newmarket H., Gr.3, BTC Eric Kirwan 2YO H., 4th STC Golden Slipper S., Gr.1, BTC Doomben Ten Thousand S., Gr.1, AJC Spring Champion S., Gr.1, Up & Coming S., Gr.2, Kindergarten S., Gr.3, NSW Tatt's RC Roman Consul S., Gr.3, STC Concorde S., Gr.3, AJC Hall Mark S., L.
Sorellina. 2 wins. See above. Jailhouse Rock. 3 wins at 1100m, 1400m in 2017-18 in Aust. Essence of Terror. 4 wins at 1000m, 1200m, A$171,360, to 2016-17, MVRC Zouki H., 2d MRC Comcater H., MVRC Ladbrokes 55 Second Challenge H., 3d MVRC Kerry Gillespie H., VRC Mittys H.
Phoenix Force. 8 wins to 1100m, 3d BRC Mittys H., Ipswich TC PA Hotel H.
Ragnar Lodbrok. 2 wins at 1050m, 1100m to 2017-18 in Aust. THORN PRINCE (Thorn Park). 9 wins from 1400m to 2500m, NZ$176,700, Taumarunui Gold Cup, L, Manawatu RC Courtesy Ford H., WRC Graphic Cup, 2d Marton JC Metric Mile, Gr.3, Feilding Gold Cup, L, Feilding JC Anzac H., L, Wanganui JC Challenge S., L, Foxton Cup, WRC Mills Reef Winery H., 3d Taumarunui Gold Cup, L, Wanganui JC Challenge S., L, Levin RC Trackside Villas H.
ALINKO PRINCE (Alamosa). 6 wins from 1400m to 2200m, NZ$155,887, to 2016-17, Marton Cup, L, 2d Feilding Gold Cup, L-twice, Waverley Cup, WRC HR Chalmers H., 3d Wellington Cup, Gr.3, Manawatu Cup, Gr.3, 4th Auckland Cup, Gr.1. MY BENTLEY (I Conquer). 6 wins from 1600m to 2200m, NZ$13,175, A$292,518, Ballarat Cup, L, MVRC Swift Signs H., MRC Betfair H., 2d Cranbourne Cup, L, Bendigo Cup, L, Kilmore Cup, L, SAJC Penny Edition S., L, 3d VRC Melbourne Cup Community Fund H.
Race Record: 16 Starts 3-2-4 A$74,935. 3 wins to 1400m to 2017-18, MRC Mypunter.com H., 2d MRC Ladbrokes Cash Out H.